Apparently it’s Teaser Tuesday (also the first day of meteorological fall here in the northern hemisphere). So here are a few paragraphs from about a third of the way through Daring and Decorum: A Highwayman Novel. Elizabeth (the narrator) and her friend Rebecca are watching a performance of As You Like It at the Theatre Royal in Bath. 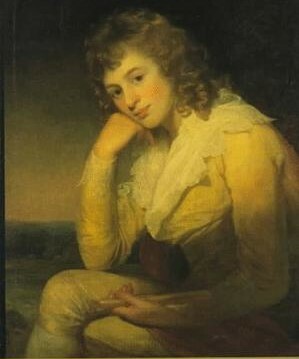 Dora Jordan, playing Rosalind, was one of the most popular English actresses of the late 18th/early 19th centuries. I was surprised when Mrs. Jordan received an ovation on her first entrance, for I had never before seen a star of the stage; when I turned to Rebecca, she assured me it was quite regular. But when Rosalind entered as Ganymede, “suited all points like a man” and exhibiting “a swashing and a martial outside,” the play nearly came to a halt as the audience murmured and some even gasped. She wore knee breeches that fit her legs like the fingers of a glove, and ankle-high shoes instead of boots, the better to show off the sensuous curves of her calves outlined in the snuggest of silk stockings. Her hair extended just to her collar, making her seem even more like a boy, yet there was also something feminine about her, so that we could never forget that underneath Ganymede’s dress was the woman, Rosalind. “Oh, yes!” I replied, though Mrs. Jordan had yet to utter her first line as Ganymede. When she did, her voice was changed. She had made it lower and huskier, to sound more like a man, yet losing none of the energy and affability that made her performance so appealing. Even in her moments of raillery with Orlando, or chiding Phebe, she had such a good-humoured nature to her that the audience could not take her for a shrew or a scold. More, on Mrs. Jordan’s lips, the words were not like speeches at all, but always had the freshness of a new thought or feeling she had discovered only that moment. The scene in which Ganymede first encountered Phebe was perhaps the strangest in the play, the director having chosen to play it broadly. When Ganymede asked, “Why do you look on me?”, Phebe practically threw herself at him; when Ganymede said, “I think she means to tangle my eyes too,” Phebe leaned up for a kiss, Ganymede averting his face at the last moment (sending another murmur of nervous laughter through the audience); and when Ganymede ordered Phebe “down on your knees,” Phebe knelt and threw her arms around Ganymede’s waist as if she would never let go (to uproarious jeers). I hazarded a glance at Rebecca to see that she no longer sat back in detachment, but was leaning forward, as engrossed as I. She caught my eye and gave me a wink.